There’s something perfect about Brian Eno’s new album, Reflection, coming out on New Year’s Day—a time of symbolic page-turning, when reflection leads to action. Eno’s ambient works are not easy listening, but they are generally quite calming, so a long stretch of gentle chimes and cooing electronics seems a perfect fit for a day that invariably contains at least a few hours of hungover malaise. Better still, it was set to be released not just as a 54-minute album but also an app, in which a grid of gently evolving colors accompanies the processes creating the tones that appear on the album. With the app, you could create your own, subtly different version of Reflection any time you put it on, for exactly the length you wanted, evolving with the time of day and even the season. It was, I thought, the perfect thing to listen to on New Year’s Day, and, given the amount that I listen to ambient while at work and on mass transit, maybe throughout 2017. My reverie ended when I saw that the app cost $39.99, at which juncture I decided that just listening to the album on repeat would probably be fine. Along with the designer Peter Chilvers, Eno has released several other apps, flowing out of his sentiment, as expressed in the liner notes for Reflection, that ambient music should be “endless music, music that would be there as long as you wanted it to be.” He says that the infinite variation of these works should be “like sitting by a river: It’s always the same river, but it’s always changing.” His previous apps, called Bloom, Scape, and Trope, played at this, letting the user generate ambient tones by pairing shapes with terms like “Ruania” and “Tolumonas.” Wipes of bright color would wash across your iPhone to a shimmering set of Eno tones, purportedly to your custom design. I never in years of using them found much variation between the settings; it was the type of thing you could hit “random” on and never tell much of a discernible difference. Still, each iteration became more complicated: The last one, 2012’s Scape, was intended as a full-scale instrument, with which users could create custom settings to send to friends. Reflection takes a hard left, removing all user input entirely. You turn it on, and it gets moving. That’s it. I know this because my curiosity eventually got the better of me, although not quite enough to drop $40—I pestered a press rep for a download code. I can’t say whether the price is worth it, because it obviously wasn’t for me, but it’s a remarkable companion on bus trips and through the work day, and on an Apple TV it blooms throughout the room with a sort of sentient benevolence. It feels like a playful god from a Miyazaki film has moved into my living room and is communicating to me through orange and green rectangles. In hindsight, that is probably worth $40. The tension there is interesting, though: Reflection flies in the face of how we determine value in music. The “my kid could paint that” argument against abstract art is best applied, in music, to ambient, which can seem on the surface to just be a single note or tone sustained for minutes at a time. If you are the type of person who prizes technical prowess, whether it’s Stevie Ray Vaughan or Mariah Carey or Kendrick Lamar, you will be disappointed with ambient music, particularly by something like this app, which no human is manipulating or even setting in motion. Ambient music is already a step away from the fingers-on-frets definition of musicianship, letting the machines (or found sounds) do the work, often unimpeded by human hands. As an app, Reflection plays directly into this—it’s not an album, it’s a process. Eno is careful to note that the canonical “album” version of it is merely 54 minutes (exactly!) of that process running. The price point corroborates that, asking for the worth not of an album but of a piece of software. But even then, it poses challenges. We expect a certain amount of utility for our buck; I own one other app that costs $40, for example, and it is a cloud-based productivity suite, which is about as utilitarian as it gets. You don’t do anything with Reflection, and it doesn’t do anything for you. What sort of software is that? These questions are asked all the time in video games, which similarly struggle with the question of when software becomes art, and how much interactivity we demand for our money. The term “walking simulator” is thrown around with disparagement for a type of game that uses the first-person vantage point and controls of Doom or Halo, but without the usual interactivity of shooting. In games like Proteus or Everybody’s Gone To The Rapture, among many others, you just sort of walk around, looking and listening. It is no coincidence that many of the best walking sims double as ambient music generators, eschewing progress and win-states for the headier pleasures of hearing a tree spark up in glorious sine-wave melody or walking through a summer field to the sound of crackling white noise and droning oboes. Games like SoundSelf and Panoramical, meanwhile, might be better described as instruments or experiences, refracting minimal input into increasingly psychedelic displays of sound and color and producing a sort of intensely transcendent state of oneness with the screen. One night I fucked around with Panoramical for so long that I discovered some weird, devilish tri-tone setting within the software somewhere, not necessarily designed by the game’s creators but of my own dark making. I turned it off and scurried out of the room. The difference between classical and contemporary music is the difference between architecture and gardening. With architecture you know in advance what you’re going to get, you specify it all, it’s all written down and drawn out and it is brought into existence. With gardening it’s not really like that. What you have to do is put together some elements that you are kind of familiar with and watch what happens to them and how this garden turns out compared to that garden. Ambient music, too, is a gentle provocation, fully owning its status as background music and shirking any claim toward technical proficiency or traditional composition. Eno has called Reflection “the most sophisticated” of his experiments in generative music, a claim for which the average user could find little argument one way or the other. It sounds nice as hell. 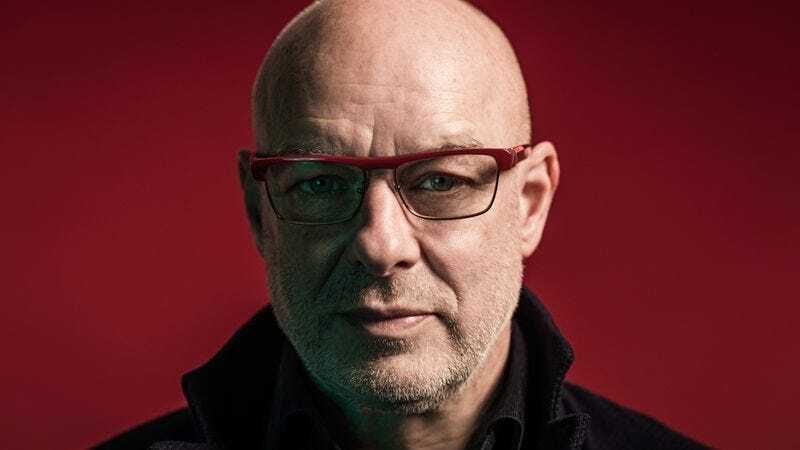 But all the other apps paid lip service toward interactivity, offering goofy shapes and made-up words; by removing that, Eno has more boldly staked a claim to his own curation of the audio experience. Reflection is no cathedral, but it is, like any of Eno’s ambient works, as lovely a garden as you could imagine. And it is, when played as software, alive, its petals and blades rustling lightly in the breeze. Going from the album to the app is no less than seeing a photograph fade into the real thing. How much is that worth?